Why Should You Consider Downsizing After Retirement? Seniors today are looking for ways to age as independently as possible. To some, this means a desire to remain living in their current homes indefinitely; however, more and more seniors are recognizing the joy that downsizing after retirement can bring. First, it’s important to recognize when your current home no longer meets your needs. For example, perhaps navigating the stairs down into the basement to do laundry has become a treacherous task. Maybe the bathrooms are not set up in a way that allows you to safely bathe and get ready for the day. Or, there could be rooms you simply don’t have a use for anymore. It’s also important to consider how much maintenance your home requires, inside and out. Yardwork, power-washing the exterior, and cleaning from top to bottom – not only do these tasks take up your precious time, they may become too difficult or dangerous for you to complete. Plus, the cost to remain living in your home is always on the rise. Upkeep, taxes, and big ticket repairs when something goes wrong, like a leaky roof or faulty furnace, can quickly add up. Downsizing your home can be a bittersweet moment in time, as you leave behind a lifetime of memories. However, moving into a senior living community allows you to lead the carefree lifestyle you’re craving, eliminating the burdens that home ownership can bring. Give yourself plenty of time. Remember, downsizing your home is a process, and the decision to downsize was probably not taken lightly. Take time to let the idea settle in, go through your household and figure out what must go with you, and allow plenty of time to properly sort items and start packing. Start small and early. Along with giving yourself ample time, once you have your moving day in mind- even if it’s not set in stone- it’s recommended to start the downsizing process as early as possible. Begin going through smaller spaces like closets and working your way into the basement, attic, or unused rooms. Make lists. Creating lists will help you stay on task throughout your move. You can keep track of things you need to do, like cancelling your utilities, notifying the post office of your new address, etc. Prepare a plan. Once you’ve chosen your senior living community, see if you can obtain a floorplan of your new living space. Not only will you have a great idea of how many of your belongings can come with you, but you’ll also be able to easily direct movers on your moving day. Start the decision-making process. The reality is you won’t be able to bring all your belongings with you; one of the most difficult aspects of downsizing is making those tough decisions about what to take and what to give to others. Sort through items quickly, making piles of what you’ll take and what can get donated, sold, or given to family. Offer items to friends and family. Don’t hesitate to offer your items that can’t go with you to your loved ones. Perhaps your daughter would love to have your dining room set and wedding china, or your neighbor could use your large, fancy Christmas tree. Enlist help from loved ones. Moving is a stressful process for anyone, and you shouldn’t feel guilty asking others to help out. Usually, family and friends are more than willing to assist you in this process. Don’t waste perishable items. As moving day approaches, start using up items in the fridge and pantry so you have less to pack up and move. Tidy up throughout the downsizing process. As you clear out rooms, take a few extra minutes to dust and vacuum instead of worrying about cleaning the house from top to bottom right before your move. Create your “first night” box. Finally, don’t forget to pack a “first night” box with items like snacks, bedding, paper products, a change of clothing and toiletries. This way, you won’t have to worry about digging through boxes or getting things unpacked, and can relax on your first night in your new home. If you’re ready to downsize your home and enjoy an easy lifestyle, we invite you to visit Trail Ridge today! 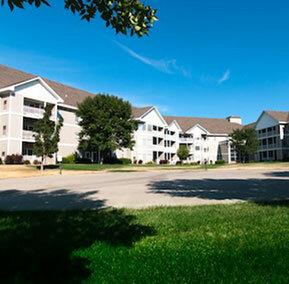 For more information about senior living options near Sioux Falls and the options available at Trail Ridge, contact us today at 605-339-4847.